Slow-cooked Indian beef and potato curry. 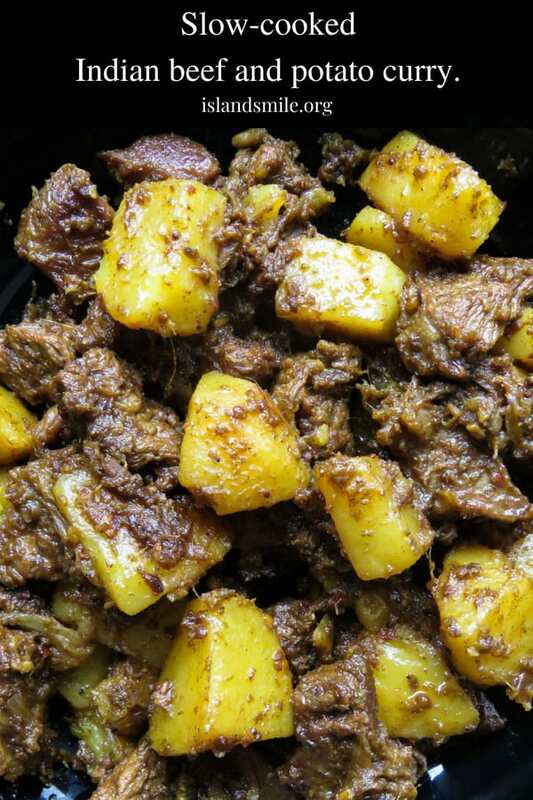 Slow cooked Indian beef and potato curry. Tender meat and potatoes cooked in spices to flavor the dry gravy. this rich curry just needs a few garlic naans, roti or paratha to serve as a meal. 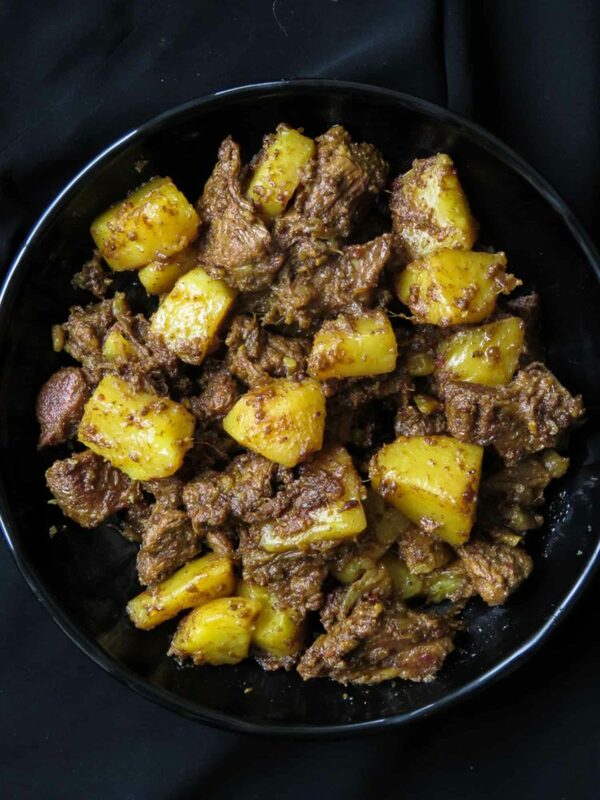 If you love Indian food just as I do and love those spicy, dry curries that they serve in many Indian restaurants then make this beef and potato curry. The flavors of this dish are so rich. 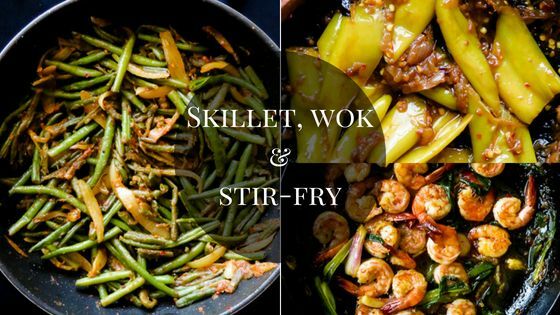 You absolutely don’t want to spoil the fragrant Indian dish by adding any more side dishes to it, unless of course, you want to make a full out Indian themed dinner spread. But for a cozy family dinner, a few pieces of garlic bread or a small portion of rice would be more than enough. You can also serve the beef and potato curry with some hot parathas. 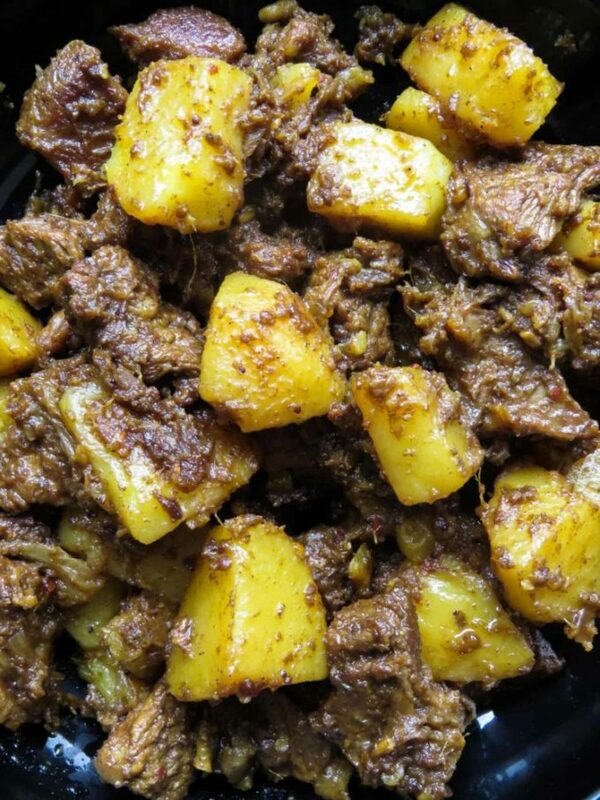 Meal ideas for the beef and potato curry. As mentioned earlier naans, parathas, roti, or any type of flatbreads are a great accompaniment to beef and potato curry. 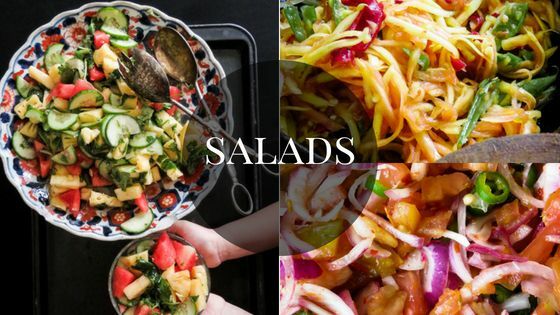 You can add a fresh salad on the side, just so you’ll feel better knowing you are eating your greens. I would suggest an Indian dal curry and if you are serving with rice, I would also suggest keeping it plain(as in not adding spices or ghee to the rice) and the portion small. 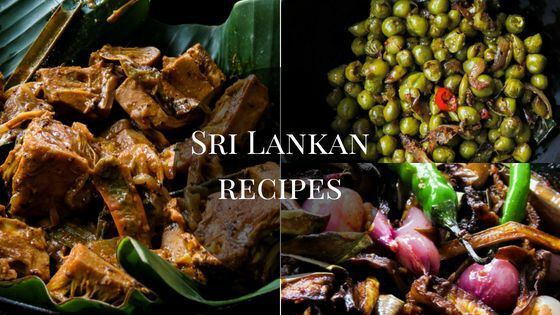 Can I substitute beef with other types of meat to make this curry? 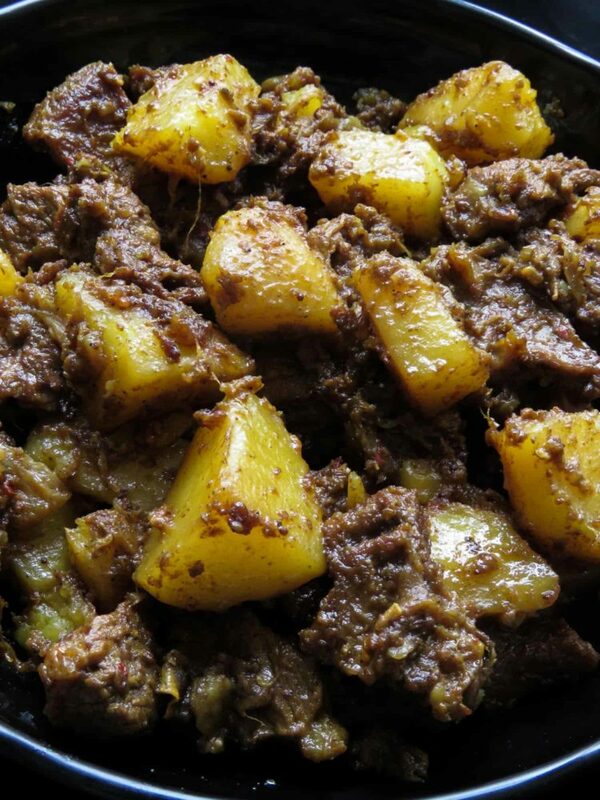 Yes, In fact, this is a dish where you usually use mutton and lamb called, alu gosht Kari. The difference is that I’ve used beef since mutton and lamb can be a little too expensive for our daily meals. Using beef for this Indian beef curry makes it a versatile dish you can try any time. Cutting board, knife, peeler, your favorite wooden spoon and a large cooking pan to assemble and cook the curry. Which cuts of beef should I choose to make the Indian curry? Topside, chuck steak, round steak would be preferable. Cut meat into cubes, they should not be small bite-size pieces but more than 1 inch. set aside. Place a large pan to hold both beef and potatoes over medium heat, pour oil and let it heat for a few seconds. Once the oil is hot, add mustard seed, fry until they pop. 20 seconds. 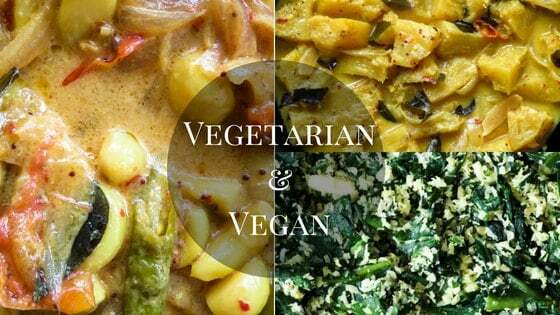 Maintain medium heat and add fenugreek, ginger, garlic and onion to the pan. Fry the ingredients until the onions turn golden. 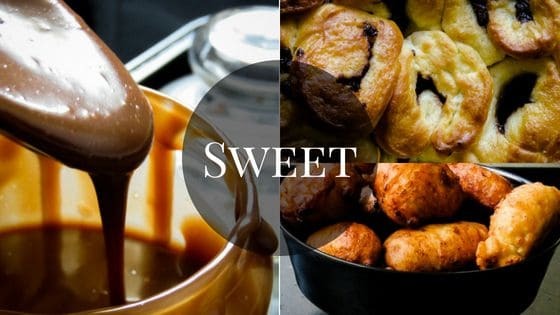 Season with salt and pour in the vinegar, combine all the ingredients in the pan until you have a semi-liquid paste. Add the meat, followed by garam masala powder and mix to coat the beef cubes thoroughly. Reduce heat to low, cover with a lid and let the beef slow cook for 1, within this time if you find the beef with the spices sticking to the pan, pour in 1/2 cup of water and let the beef continue to simmer. Once the allotted time to cook the beef is done, add the potatoes and continue to cook until the potatoes are tender.30 minutes. pour in another 1/2 cup of water if you need to help soften the potatoes. check for seasoning before you let it simmer again. Slow simmer until potatoes are tender and the gravy turns into a fragrant spicy semi-liquid, thick gravy, coating both beef and the potatoes. Garnish with chopped coriander and serve warm. recipes with beef you can try. Easy beef and pumpkin curry(one pot, Sri Lankan). Slow cooked Sri Lankan beef curry. Healthy beef and barley soup. Garlic-coriander minced Beef keema curry. Kanglun soy, garlic beef stir-fry. Pan fried sizzling black beef. Bone broth based, chunky beef and vegetable soup. SLOW COOKED INDIAN BEEF AND POTATO CURRY. TENDER MEAT AND POTATOES COOKED IN SPICES TO FLAVOR THE DRY GRAVY. THIS RICH CURRY JUST NEEDS A FEW GARLIC NAANS, ROTI OR PARATHA TO SERVE AS A MEAL.